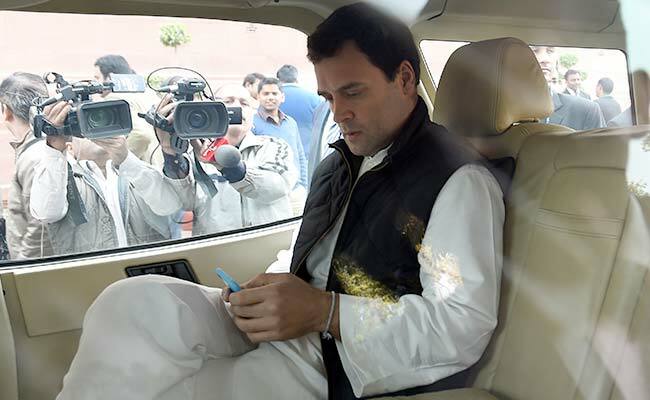 Congress leader Vivek Pradhan from Meerut has been suspended by the party for referring to Rahul Gandhi on WhatsApp as 'Pappu'. A Congress leader in Uttar Pradesh has been penalized after he referred to party Vice President Rahul Gandhi as "Pappu" on a WhatsApp group that included party workers. Some BJP leaders including party president Amit Shah and other critics of Mr Gandhi, 46, refer to him disparagingly as "Pappu" (young boy) to suggest he is clueless, usually on social media. Vivek Pradhan was removed as district president of Meerut after his messages, which, he said, were "a mistake" by a team member who handles his social media. The string of posts from Mr Pradhan praised Mr Gandhi, but repeatedly used "Pappu." He was summoned this evening by actor-politician Raj Babbar, who chiefs the Congress in Uttar Pradesh. A Congress letter calls the WhatsApp messages "insulting and provocative" and flagged them as "an attempt to malign the party leadership." The BJP said Mr Pradhan's punishment exposes the Congress' sycophancy. "Punishment for 'Pappu' followed quickly but there was no penalty for calling the army chief a roadside goon," said BJP spokesperson Sambit Patra. On Sunday, Congress leader Sandeep Dikshit used "sadak ke goonde" to refer to the chief of the army, General Bipin Rawat, whose recent language he allegedly has been unbecoming. Mr Gandhi, however, said Mr Dikshit, a former MP, was totally out of line and that it was unacceptably to try and "do politics with the army". However, the BJP has said that Mr Dikshit has been let off with a rap on the wrist and demanded that he be expelled by the Congress. Mr Pradhan, of the WhatsApp controversy, has said he plans to meet Mr Gandhi to offer an explanation. He will have to wait. Mr Gandhi announced yesterday that he is flying abroad to spend time with his grandmother. His break comes as the Congress is attacking the government over the killing of five farmers by the Madhya Pradesh police at a mass protest and when the opposition is uniting over a possible election for President of India. Recent revolts by farmers in Madhya Pradesh and Maharashtra, both states governed by the BJP, demanding loan waivers and better prices for their produce have allowed the opposition to claim Prime Minister Narendra Modi's party has no commitment to relieving rural distress. Senior Congress leader Ghulam Nabi Azad said that Mr Pradhan's punishment is not exaggerated. "We have only suspended him, it's the smallest punishment," he said.